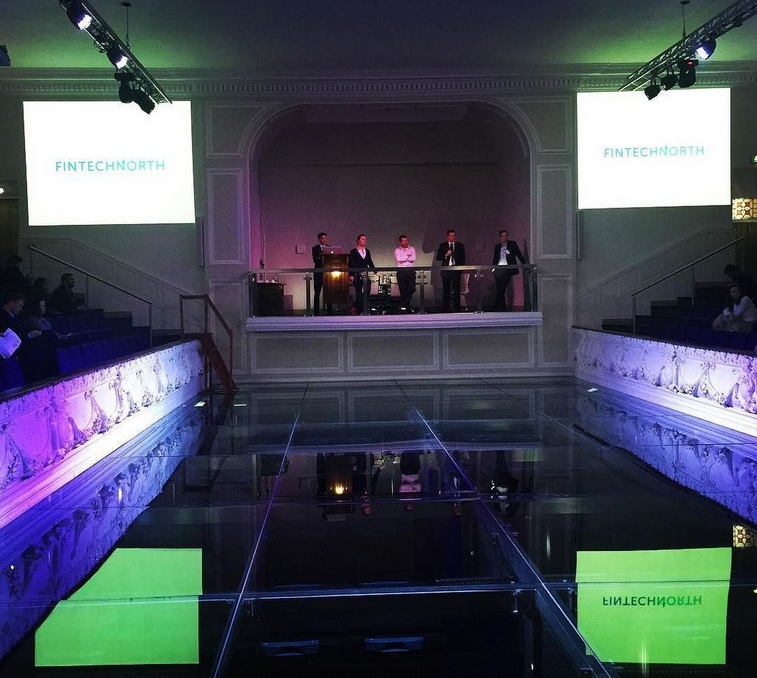 Earlier this week, I was at the FintechNorth event in Leeds, UK. A very well organized, small conference with about 150-200 attendants. 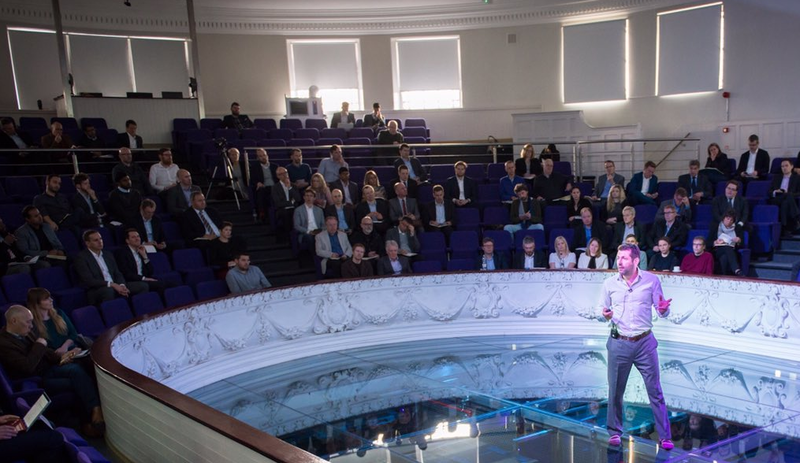 After a welcome from Adam Beaumont, founder of aql and a chairman address by Dan Rajkumar, CEO of p2p lending marketplace Rebuildingsociety, who co-organized the event, Chris Sier, director of FiNexus gave a very interesting presentation on the current state of the fintech market and the economic context. Very interesting event venue in former Salem church. Beneath the glass, that Chris Sier is standing on there is the server farm of Aql’s datacentre. Chris Sier put forward the provocative thought that we are at a cusp of a new banking crisis [in the UK] because of the rise of peer to peer lending. His argument is that the rising market share of p2p lending marketplaces will take away that much working capital from the banks that it will critically diminish the ability of the banks to create credit. Applied futurist Tom Cheesewright than gave his assessment of the current state of digital innovation, saying he is still optimistic but not as bullish as he was a few years ago on the prospects of fintech and digital transformation. Another very interesting presentation was ‘The future of lending’ by Richard Carter, the CEO of Nostrum Group, which provides digital lending technology to banks, finance companies and brands (one of their clients is Lendable). He thinks that the biggest gamechanger could actually be that a company like Paypal, Facebook or Amazon starts to make lending offers to their customer and thereby makes use of the size of their existing customer base, the trust these customers have into the brand and the vast amount of data these companies have collected on their customers which will benefit them in the assessment of the credit risk. He showed a chart with portfolio balances of unsecured loans in the UK (Lloyds 9.6bn GBP, RBS 8.9bn GBP, HSBC 8.9bn GBP, Santander 5.5bn GBP, Barclays 4.9bn GBP, Zopa 1bn GBP). He expects to see totally different names on that chart in the future. After the lunch break James Sherwin Smith presented Growth Street, a company that offers overdrafts to SMEs. One aspect he mentioned was that all talks with banks about collaboration opportunities so far led nowhere. The banks are unable/unwilling to understand that they need to regain the trust of their SME customers (‘only 13% of SMEs trust their bank to act in their best interest’). Markus Simson of Ziraff and Tiit Pekk of Codeborne gave some fascinating examples of the efforts to digitize a whole country: Estonia. I was aware of the great progress before, but I find it striking over and over when I hear tidbits about what it means for everyday life. E.g. 99% of state services are online. Tax declaration takes 3 minutes now, but that is considered too long, therefore the next step is to make it ‘zero click’. 98% of medical prescriptions are handled online, no paperwork. Only marriages and divorces are still conducted offline. Wonder about the latter – too messy? Tiit claims to be able to setup a new mobile bank (including all regulatory compliance, KYC, AML, card services) within months.Ollie Maitland, co-founder, demoed the services of Capitalise, which provides compares alternative finance options for SMEs. To analyse the cashflow and the financing need of the business, Capitalise hooks into the accounting system of the business. Based on the analysed data and the financing need Capitalise then suggests different lenders. Finally Malcolm South & Nick Newton of White Label Crowdfunding, a spin-off of Rebuilding Society gave a workshop on the lifecycle of a crowdfunding business.